Hello how are you? Yesterday was Jayne's birthday!!!!! Jayne is one of my much loved Passionettes and she is just lovely, we are yet to meet but I know she's lovely because we chat plenty. This is the card I made to mark her special day. oh I just love this combo!! Jayne's favourite colour is Hot Pink so I choose Pink Passion. I paired it with Summer Sun and Chocolate Chip for a really punchy combo, it just fascinates you is so bright. 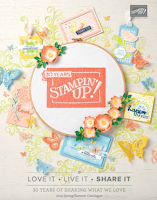 And how about that stamp set? Is the new level 2 hostess set called Whimsical Wings and I lubbe it lots. I used the markers to colour the whole image, sentiment part of the set called A Bit Of birthday cheer, taffeta in chocolate chip and the scallop edge punch used to create a border. Would you like to earn this set for FREE? then why don't you join my new virtual hostess club starting 1st of October? Find more details by clicking on the link at the top of my blog. Another stunner and I love how you just use whatever the heck colour you like and it always rocks the house. Beautiful work on Jane' card. Wow Monica, what a fab colour combo - I love it! The card's wonderful too. Oh just love the card Monica and the colour scheme is Yum! 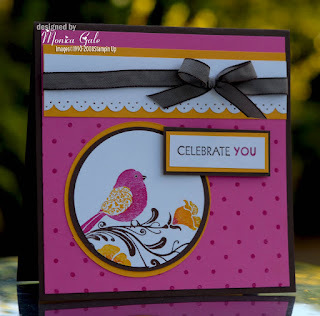 Beautiful card Monica and love how you colored your main image! tfs!!! Beautiful card Monica, I love the colour combination - and that new set is fabulous.